There are experiments that seem to confirm the idea that too much thinking harms performance. But here’s a model in which thinking always improves performance and which is still consistent with the empirical observation that thinking is negatively correlated with performance. In any activity we rely on two systems: one which is conscious, deliberative and requires “thinking.” The other is instinctive. Using the deliberative system always gives better results but the deliberation requires the scarce resource of our moment-to-moment attention. So for any sufficiently complex activity we have to ration the limited capacity of the deliberative system and offload many aspects of performance to pre-programmed instincts. But for most activities we are not born with an instinctive knowledge how to do it. What we call “training” is endless rehearsal of an activity which establishes that instinct. With enough training, when circumstances demand we can offload the activity to the instinctive system in order to conserve precious deliberation for whatever novelties we are facing which truly require original thinking. An athlete or performer who has been unsettled, unnerved, or otherwise knocked out of his rhythm finds that his instinctive system is failing him. The wind is playing tricks with his toss and so his serve is falling apart. Fortunately for him he can start focusing his attention on his toss and his serve and this will help. He will serve better as a result of overthinking his serve. But there is no free lunch. The shock to his performance has required him to allocate more than usual of his deliberative resources to his serve and therefore he has less available for other things. He is overthinking his serve and as a result his overall performance must suffer. Star Michigan guard Trey Burke collected two personal fouls in the early minutes of the National Championship game against Louisville and he was promptly benched and sat out most of the remaining first half. The announcers didn’t bother to say why because its common wisdom that you don’t want your best players fouling out early. But the common wisdom requires some scrutiny because on its surface it actually looks absurd. You fear your best player fouling out because then his playing time might be limited. So in response you guarantee his playing time will be limited by benching him. Jonathon Weinstein once made this point. But just because basketball commentators, and probably even basketball coaches, don’t properly understand the rationale for the strategy doesn’t mean the strategy is unsound. In fact it follows from a very basic strategic idea: information is valuable. Suppose the other team is scoring points at some random rate. If they are lucky they score a lot and if they are less lucky they score fewer. If the other team scores a lot your team should start shooting threes and go for short possessions to catch up. If the other team scores fewer you should go for safer shots and run down the clock. But you only know which of these you should do at the end of the game. If your best players are on the bench at that time you cannot capitalize on this information. Professional soccer leagues tend to be dominated year after year by a small number of top teams. Major League Baseball on the other hand, has seen World Series appearances by the Detroit Tigers, the Texas Rangers, the Philadelphia Phillies, the Tampa Bay Rays, etc. It seems like any team can assemble a champion. These two sports have very different production functions. A baseball team is basically a collection of individuals. Among team sports its the closest thing to an individual sport. A team’s output is basically the sum of individual outputs with very little complementarity. In baseball there is very little talk of one player making his teammates better. The production function is additive and, offensively, players are perfectly substitutable. Soccer is at the other extreme where players are highly complementary. Scoring a goal is a total team effort. Even the best striker needs good chances. In soccer, the best players are more productive when there are other good players on the team. The production function is closer to Leontif. These differences in production explain the differences in market structure. Consider competitive bidding for a top player in the two sports. In baseball that player’s marginal product is the same on any team he would play for so many teams will compete and any team could land him. In soccer that player’s marginal value is highest for the team that is already the best. The competition is going to be very weak and he is likely to sign with the best team. In baseball competition levels the playing field. In soccer it tilts it even further. In a symmetric equilibrium of this game the two players will randomize their guesses in such a way that each earns the same expected payoff. But now suppose that player 1 can publicly announce his guess before player 2 moves. Player 1 will choose heads and player 2’s best reply is to choose tails. By making this announcement, player 1 has increased his payoff to a 5/8 chance of winning the pot of money. 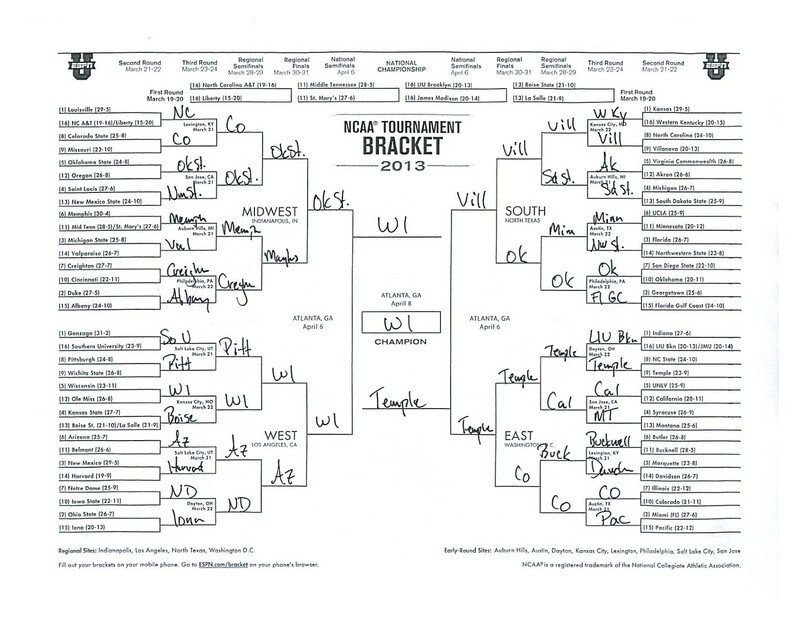 This principle applies to just about any variety of bracket-picking game, hence my announcement. In fact in the psychotic version we play in our department, the twisted-brain child of Scott Ogawa, each matchup in the bracket is worth 1000 points to be divided among all who correctly guess the winner, and the overall winner is the one with the most points. Now that all of my colleagues know that the upsets enumerated above have already been taken by me their best responses are to pick the favorites and sure they will be correct with high probability on each, but they will split the 1000 points with everyone else and I will get the full 1000 on the inevitable one or two upsets that will come from that group. 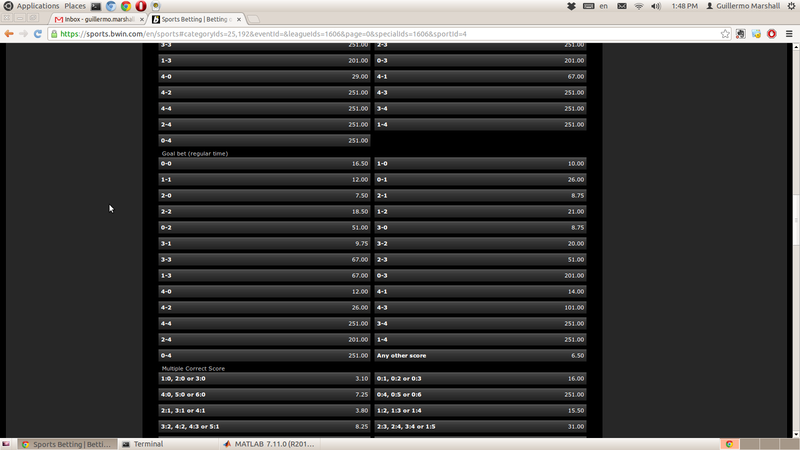 this a screenshot, from a few minutes ago (ed: last week), of bwin.com. the bets here are on goals in regular time of the barcelona-milan to be played in a little while. barcelona lost 2-0 in milan so barcelona needs at least 2 goals to force extra-time/penalty kicks. this is for the champions league. as you can see from the screenshot barcelona winning 1-0 pays 10, 2-0 pays 7.5, 3-0 pays 8.75, while 4-0 pays 12.
what can we learn from this non-monotonicity? gamblers anticipate that barcelona’s extra incentives to score the 2-0 goal make it a more likely event than the 1-0 result (even though they have to score an extra goal!). once they have scored the 2-0, those extra incentives vanish so we are back to the intuition that a result with more goals is less likely. How could this effect play out in real time? Here’s a model. It takes effort to increase the probability of scoring a goal. An immediate implication is that if the score is 0-0 with little time left, Barcelona will stop spending effort and the game will end 0-0. Too late in the game and it becomes so unlikely they can score two goals that the effort cost isn’t worth it. But if the score is 1-0 they will continue to spend effort beyond that point. So there is some interval near the end of the game where the conditional probability of scoring a goal is positive if the score is 1-0 but close to zero if the score is 0-0. I would be interested in seeing some numbers calibrated to generated the betting odds above. We need three parameters. The first two are the probability of scoring a goal in a given minute of game time when Barcelona spends effort, and when it does not. The second is Barcelona’s rate of substitution between effort and win-probability. This could be expressed as follows. Over the course of a minute of play what is the minimum increase in win probability that would give Barcelona sufficient incentive to spend effort. These three parameters will determine when Barcelona stops spending effort in the 1-0 versus 0-0 scenarios and given this will then determine the probabilities of 1-0, 2-0, 3-0 etc. scores. Consider a team selling tickets for its upcoming baseball season. Before the season begins it offers a bundle of tickets for every game. Some of these games however are certain to have very low attendance (games on a Tuesday, games against poor opponents, etc.) The tickets for these games will be placed on the secondary market at very low prices. Indeed one of the biggest problems for teams is the inability to prevent those secondary market prices from falling so low that they cannibalize single-game box office sales. The problem is so severe that many baseball teams are making arrangements with StubHub to enforce a price floor on that exchange. The problem has a much simpler solution: stop selling season tickets. The team should instead offer the following type of bundle: you may purchase tickets for all of the predictably high-demand games at the usual season ticket discount.Then you may add to that bundle any subset of the low-demand games you desire but each at a price equal to the face value of the ticket. This arrangement will make both season ticket holders and the team better off. Season ticket holders will opt not to add the low demand games (unless the opponent is a team they really like for example) and since they weren’t going to those games anyway they are saving money. The team will increase revenue: supply of tickets to low demand games will be controlled. Secondary market tickets will be priced at or near face value because nobody will buy a ticket at face value for a lousy game unless they actually plan to use the tickets. This enables the team to hold prices at their desired (i.e. revenue maximizing) level without cannibalism. A fascinating article I found after digging through Conor Friedersdorf’s best of journalism. What distinguishes a great mnemonist, I learned, is the ability to create lavish images on the fly, to paint in the mind a scene so unlike any other it cannot be forgotten. And to do it quickly. Many competitive mnemonists argue that their skills are less a feat of memory than of creativity. For example, one of the most popular techniques used to memorize playing cards involves associating every card with an image of a celebrity performing some sort of a ludicrous — and therefore memorable — action on a mundane object. When it comes time to remember the order of a series of cards, those memorized images are shuffled and recombined to form new and unforgettable scenes in the mind’s eye. Using this technique, Ed Cooke showed me how an entire deck can be quickly transformed into a comically surreal, and unforgettable, memory palace. The author documents his training as a mental athlete and his US record breaking performance memorizing a deck of cards in 1 minute 40 seconds. I personally have a terrible memory, especially for names, but I don’t think this kind of active memorization is especially productive. The kind of memory enhancement we could all benefit from is the ability to call up more and more ideas/thoughts/experiences related to whatever is currently going on. We need more fluid relational memory, RAM not so much. Another good one from Scott Ogawa. It’s the Creampuff Dilemma. A college football coach has to set its pre-season non-conference schedule, thinking ahead to the end-of-season polling that decides Bowl Bids. A schedule stocked with creampuffs means lots of easy wins. But holding fixed the number of wins, a tough schedule will bolster your ranking. Check out the prices on Stub Hub for tickets to the upcoming Big10 basketball game between the Iowa Hawkeyes and the Wisconsin Badgers. Quite a few of them are significantly below the $24 face value of the tickets. This can happen because fans who buy season tickets for Badgers basketball are buying for the games against the conference powerhouses. For the games against cellar dwellers like Iowa they dump their tickets on the secondary market at whatever price they will fetch. Coping with scalpers who buy tickets through the box office and resell them at inflated prices is one thing. You could have raised prices yourself but you chose not to. But what do you do when scalpers are undercutting your box office price? You should buy the tickets back from the scalpers is what you should do. The fans who are going to buy from the scalper at the low price might also be willing to buy at box office prices. If you buy the cheap tickets on StubHub first then the box office is the only option left for them. And if they do buy from the box office you have made a profit because you bought low and sold high. But there’s a chance those fans aren’t willing to pay box office prices and in that case you’re just losing money. So there’s a tradeoff. It means that you don’t want to buy secondary market tickets at prices just below your box office price but you definitely do want to buy the tickets priced so low that they are worth the risk. Indeed there is some optimal offer price that you should be prepared to repurchase tickets at. In fact every venue’s box office should be both a buyer and seller of tickets with an optimally calculated spread between bid and ask prices. Now you might wonder whether this only further encourages season ticket holders to dump their unwanted tickets. Indeed it does but that’s exactly what you want them to do. The tickets will be reallocated more efficiently and you will capture the gains from trade. Moreover, fans are now willing to pay higher prices for season tickets if they know they can easily resell their unwanted tickets. You can then raise season ticket prices to capture those gains. But there was one off-hand comment that I think the author got completely wrong. I think NBA basketball players might be the best at what they do in all of sports. The thought experiment is to compare players across sports. I.e., are basketball players better at basketball than, say, snooker players are at playing snooker? Unless you count being tall as one of the things NBA basketball players “do” I would say on the contrary that NBA basketball players must be among the worst at what they do in all of professional sports. The reason is simple: because height is so important in basketball, the NBA is drawing the top talent among a highly selected sub-population: those that are exceptionally tall. The skill distribution of the overall population, focusing on those skills that make a great basketball player like coordination, quickness, agility, accuracy; certainly dominate the distribution of the subpopulation from which the NBA draws its players. Now you might ask why we should discard height as one of the bundle of attributes that we should say a player is “best” at. Aren’t speed, accuracy, etc. all talents that some people are born with and others are not, just like height? Definitely so, but ask yourself this question. If a guy stops playing basketball for a few years and then takes it up again, which of these attributes is he going to fall the farthest behind the cohort who continued to train uninterrupted? He’ll probably be a step slower and have lost a few points in shooting percentage. He won’t be any shorter than he would have been. When you look at a competition where one of the inputs of the production function is an exogenously distributed characteristic, players with a high endowment on that dimension have a head start. This has two effects on the distribution of the (partially) acquired characteristics that enter the production function. First, there is the pure statistical effect I alluded to above. If success requires some minimum height then the pool of competitors excludes a large component of the population. There is a second effect on endogenous acquisition of skills. Competition is less intense and they have less incentive to acquire skills in order to be competitive. So even current NBA players are less talented than they would be if competition was less exclusive. The final seconds are ticking off the clock and the opposing team is lining up to kick a game winning field goal. There is no time for another play so the game is on the kicker’s foot. You have a timeout to use. Calling the timeout causes the kicker to stand around for another minute pondering his fateful task. They call it “icing” the kicker because the common perception is that the extra time in the spotlight and the extra time to think about it will increase the chance that he chokes. On the other hand you might think that the extra time only works in the kickers favor. After all, up to this point he wasn’t sure if or when he was going to take the field and what distance he would be trying for. The timeout gives him a chance to line up the kick and mentally prepare. So much for icing? No! Icing the kicker is a successful strategy because it keeps the kicker guessing as to when he will actually have to prepare himself to perform. The optimal use of the strategy is to randomize the decision whether to call a timeout in order to maximize uncertainty. We’ve all seen kickers, golfers, players of any type of finesse sport mentally and physically prepare themselves for a one-off performance. The mental focus required is a scarce resource. Randomizing the decision to ice the kicker forces the kicker to choose how to ration this resource between two potential moments when he will have to step up. Indeed the simplest model would imply that the optimal icing strategy equalizes the kicker’s success probability conditional on icing and conditional on no icing. So the statistics quoted in the WSJ article are perfectly consistent with icing as part of an optimal strategy, properly understood. But whatever you do, call the timeout before he gets a freebie practice kick. It’s clear that lots of sports franchises suffer from suboptimal ticket-pricing schemes. Between games that feature many empty seats, games that sell out entirely, and the ability of scalpers to obtain profits on the secondary market, money is obviously being left on the table. The University of Minnesota is trying an interesting idea with its new Golden Ticket pricing concept that for $75 lets you attend all nine Big Ten men’s basketball matchups. The catch is that if you go to a game and Minnesota loses, then your pass expires. The idea is that demand is low for games against weak opponents so Golden Ticket holders will fill the empty seats. They will find it too risky to attend the games against strong opponents freeing up supply to accomodate the increased demand for those games. Watching the Olympic Games this Summer I noticed that the volleyball competition has changed the scoring system from the old “sideout” system to what used to be called “quick score.” (This change may have happened a long time ago, I don’t watch much volleyball.) The traditional sideout scoring method increments the score only when the serving team wins a point. When the serving team loses the point the serve is awarded to the other team (a “sideout”) but the score is unchanged. This can lead to long drawn out games with repeated sideouts and little scoring. As a stopgap, in the old days, volleyball matches would switch to the quick score system after a certain amount of time has elapsed. In quick scoring a sideout earns a point for the team that gains the serve. I always liked the sideout system, thinking of it as a characteristic volleyball rule that is compromised for expediency by the switch to quick score. Instinctively it seemed that the fact you could only score when you are serving played a big role in volleyball strategy. But when I was watching this summer it occurred to me that the two scoring systems are less different than it appeared at first. The basic observation is that at any stage of the game sideout scores are just quick scores minus the number of sideouts. And sideouts necessarily alternate between teams so the number you are subtracting differs by at most one across the two teams. So I started to think if there was a way to characterize the mapping between scoring systems that would clarify precisely the strategic impact of the switch. And I think I figured it out. Quick scoring is equivalent to the following system: 28 points will be played. After 28 points (let’s call it regulation) if the score is tied (14-14) then they continue to play until some team has a 2 point advantage. This is in turn equivalent to side-out scoring with the following amended rules. Lets refer to the team that receives serve in the first point of the game as the receiving team. A total of 28 ponts is played in regulation. the receiving team either scored the last point or earned a side-out in the last point and the receiving team is ahead by 1 point. In this case the receiving team wins. If none of these conditions are met then the game continues past regulation. We define the team that has the serve in the first point past regulation as team 1 and the other team as team 2. The score is reset to 0-0. Play continues (with side-out scoring) until the first moment at which one of the following occurs. Team 1 has a 2 point lead, in which case team 1 is the winner. Team 2 has a 1 point lead, in which case team 2 is the winner. The proof of this equivalence is below the jump. Here’s what it means. Quick scoring is not an innoccuous change in the rules to speed up play but its pretty close. Because a near identical outcome would obtain if instead of switching to quick score, we keep sideout scoring but cap the number of regulation points at 28. Its nearly, but not exactly identical because of the two scoring “epicycles” that have to be appended, namely #3 in regulation and #2 in overtime. Note that both of these wrinkles tend to benefit the receiving team. I don’t know the stats (anybody?) but it appears to me that the receiving team already has a large advantage in volleyball at the level of an individual point. You could say that an effect of sideout scoring is that it levels the playing field by giving a small overall advantage to the serving team. The switch to quick scoring eliminates that. I wonder if there is a noticeable difference in the frequency with which the (initially) receiving team wins a volleyball game after the switch to quick scoring. Its socially valuable for the University of Michigan measure consumer confidence and announce it even if that is an irrelevant statistic. Because otherwise somebody with less neutral motives would invent it, manipulate it, and publicize it. Kids are not purely selfish. They like it when they get better stuff than their siblings. To such an extent that they often feel mistreated when they see a sibling get some goodies. Someone should develop a behavioral theory of how people play Rock, Scissors, Paper when its common knowledge that humans can’t generate random sequences. The shoulder is the kludgiest joint because there are infinitely many ways to do any one movement. Almost surely you have settled into a sub-optimal way. I go to a million different places for lunch but at each one I always order one dish. Economists Andrew Healy, Neil Malhotra, and Cecilia Mo make this argument in afascinating article in the Proceedings of the National Academy of Science. They examined whether the outcomes of college football games on the eve of elections for presidents, senators, and governors affected the choices voters made. They found that a win by the local team, in the week before an election, raises the vote going to the incumbent by around 1.5 percentage points. When it comes to the 20 highest attendance teams—big athletic programs like the University of Michigan, Oklahoma, and Southern Cal—a victory on the eve of an election pushes the vote for the incumbent up by 3 percentage points. That’s a lot of votes, certainly more than the margin of victory in a tight race. And these results aren’t based on just a handful of games or political seasons; the data were taken from 62 big-time college teams from 1964 to 2008. And Andrew Gelman signs off on it. I took a look at the study (I felt obliged to, as it combined two of my interests) and it seemed reasonable to me. There certainly could be some big selection bias going on that the authors (and I) didn’t think of, but I saw no obvious problems. So for now I’ll take their result at face value and will assume a 2 percentage-point effect. I’ll assume that this would be +1% for the incumbent party and -1% for the other party, I assume. Incumbents have an advantage on average. Higher overall turnout therefore implies a bigger margin for the incumbent, again on average. In sports, the home team has an advantage on average. Conditions that increase overall scoring amplify the advantage of the home team. Good weather increases overall turnout in an election and overall scoring in a football game. So what looks like football causes elections could really be just good weather causes both. Note well, I have not actually read the paper but I did search for the word weather and it appears nowhere.